Thank you very much! 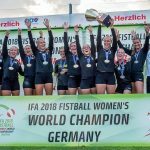 The 8th Fistball Women’s World Championship could not have been delivered so successfully without the excellent support of our sponsors, supporters, partners and more than 1.000 volunteers. At perfect weather conditions, 8.000 spectators attended the five-day event in the ÖBV arena in Linz. In addition to being a highlight from a sports perspective, the event was also a big success in terms of media coverage in press, TV, radio and online, as well as in terms of economic value added. We hope that the success of the event will continue to foster collaboration with sponsors and partners in support of the development of fistball.